Running on the treadmill torches calories fast. The treadmill is a go-to machine for cardio exercise, boosting heart health while obliterating calories for faster weight loss. 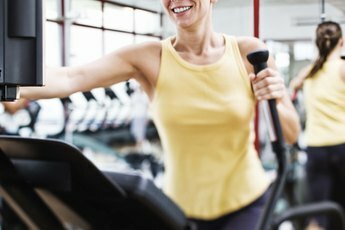 The exact number of calories you'll expend on the treadmill depends on your workout intensity, but with a few quick calculations you can estimate your burning power. If you're new to exercise or have any medical problems, see your doctor before hitting the treadmill. A pound of fat is about 3,500 calories, so assuming your weight is steady on your current diet, that's how much you have to burn on the treadmill to lose 1 pound. Walking at 3.5 mph, a 155-pound woman uses about 300 calories per hour. If she walks an hour a day, five days per week -- a healthy schedule -- she'll burn 1,500 calories each week, or 9,000 calories in six weeks -- thereby losing about 2 1/2 pounds. 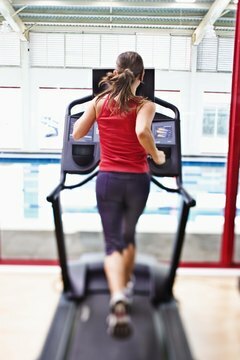 If the same woman runs at 5 mph instead of walking, she'll double her calorie burn and lose about 5 pounds in six weeks. If you're serious about slimming down, pay as much attention to your diet as you do your treadmill routine. Any calories burned through exercise won't lead to weight loss if you replace them with food, so keep portion sizes small and write down everything you eat to create accountability. Focus on eating fresh, microwaved and steamed veggies -- boiling removes too many nutrients -- along with whole grains and lean protein at each meal. Snack on fruit, nonfat yogurt or a few nuts instead of chips or cookies. Sure it feels great to step on the scale and see that you've dropped 3 pounds overnight, but healthy and sustainable weight loss happens at a slower rate. HelpGuide.org recommends losing 1 to 2 pounds per week, which works out to 6 to 12 pounds in six weeks. Losing more than that leads to water and muscle loss, not extra fat loss. Plus, rapid weight loss typically requires severe calorie restriction, which can take a toll on your health by causing malnutrition. As you walk or run on the treadmill, keep your shoulders back and your abdominal muscles tight, holding your chin up rather than looking down. Avoid drifting to the sides or back of the belt as you move -- you're safer in the middle. Maintain a normal, relaxed stride when you walk, and practice with varying speeds and inclines to find the best program for you. 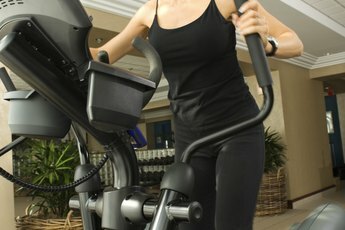 When you get on and off of the treadmill, the belt should be stopped or moving no faster than half a mile per hour.